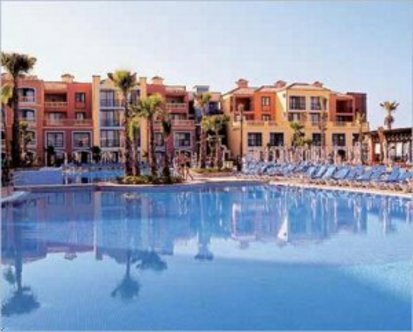 THE BAHIA PRINCIPE TENERIFE HOTEL IS LOCATED AT THE SOUTHERN TIP OF PARADISE BEACH IN COSTA ADEJE, NEXT TO THE BAHIA PRINCIPE COSTA ADEJE SITUATED ON THE SEAFRONT, THEY OCCUPY TOGETHER A SURFACE OF 8000SQM AND BOAST EXCELLENT VIEWS OF THE SEA AND THE ISLAND OF LA SOMERA. THE AREA IS KNOWN FOR EL PUERTITO, IT'S PROXIMITY TO LOS ACANTILADOS DE LOS GIGANTES AND THE NEW ADEJE GOLF COURSE. THE HOTEL HAS IT'S OWN SHOPPING AND LEISURE CENTER. IT HAS 220 JUNIOR SUITES LUXURY FITTINGS APPROPRIATE TO THIS CATEGORY OF HOTEL -4 STARS SUPERIOR-. OUR HOTEL HAS A MAIN RESTAURANT BUFFET, 2 A-LA-CARTE RESTAURANTS -ASIA AND MEXICO-, SNACK BAR.